An original letter of correspondence between brothers and business partners Joshua Coffin Chase and Sydney Octavius Chase. Topics discussed in the letter include the unsatisfactory results of the piece system of paying workers and fruit packing at Isleworth Grove and Wiley Avenue. 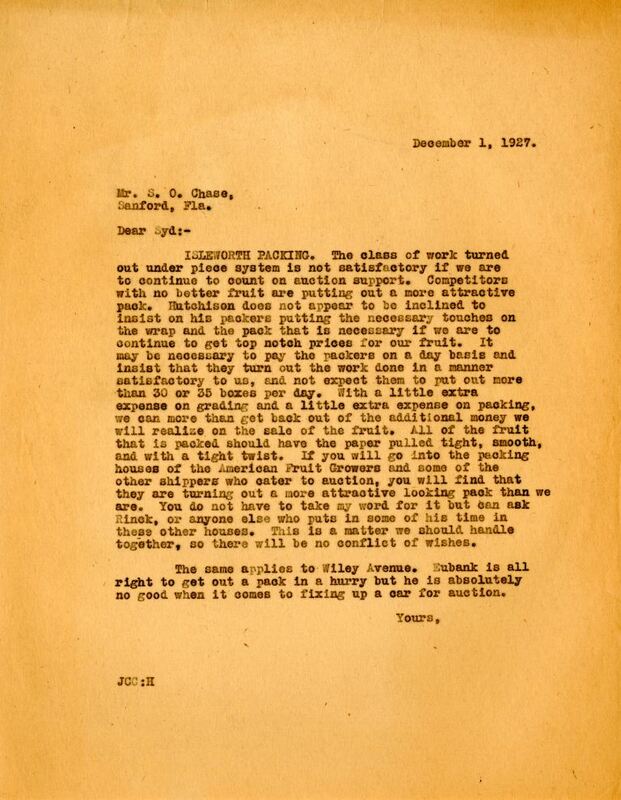 Original letter from Joshua Coffin Chase to Sydney Octavius Chase, December 1, 1927: box 49, folder 20.91, Chase Collection (MS 14), Special and Area Studies Collections, George A. Smathers Libraries, University of Florida, Gainesville, Florida. Chase Collection (MS 14), box 49, folder 20.91, Special and Area Studies Collections, George A. Smathers Libraries, University of Florida, Gainesville, Florida. ISLEWORTH PACKING. The class of work turned out under piece system is not satisfactory if we are to continue to count on auction support. Competitors with no better fruit are putting out a more attractive pack. Hutchinson does not appear to be inclined to insist on his packers putting the necessary touches on the wrap and the pack that is necessary if we are to continue to get top notch prices for our fruit. It may be necessary to pay the packers on a day basis and insist that they turn out the work done in a manner satisfactory to us, and not expect them to put out more than 30 or 35 boxes per day. With a little extra expense on grading and a little extra expense on packing, we an more than get back out of the additional money we will realize on the sale of fruit. All of the fruit that is packed should have the paper pulled tight, smooth, and with a tight twist. If you will go into the packing houses of the American Fruit Growers and some of the other shippers who cater to auction, you will find that they are turning out a more attractive looking pack than we are. You do not have to take my word for it but can ask Rinck, or anyone else who puts in some of his time in these other houses. This is a matter we should handle together, so there will be no conflict of wishes. The same applies to Wiley Avenue. Eubank is all right to get out a pack in a hurry but he is absolutely no good when it comes to fixing up a car for auction. Chase, Joshua Coffin. 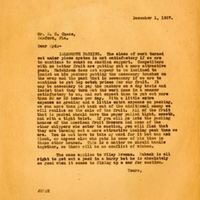 “Letter from Joshua Coffin Chase to Sydney Octavius Chase (December 1, 1927).” RICHES of Central Florida accessed April 21, 2019, https://richesmi.cah.ucf.edu/omeka/items/show/2769.